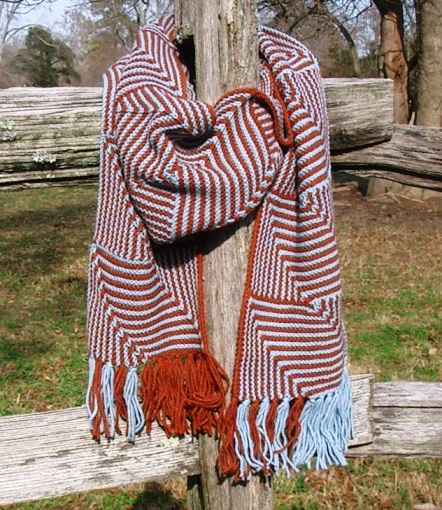 Zed Scarf, from Interweave Knitscene Accessories 2013. 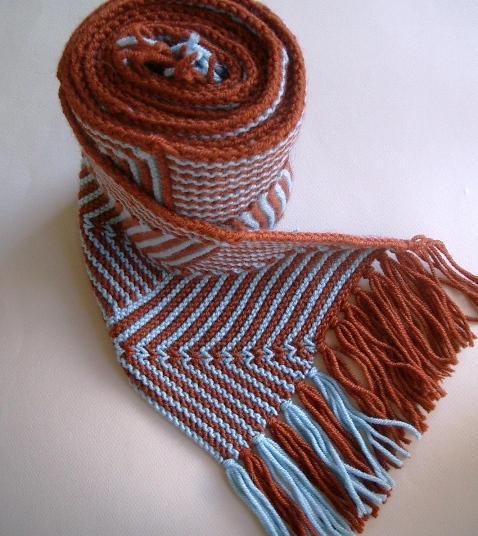 A new design of mine is in Interweave Knitscene Accessories, 2013! This issue is just out! It is the Zed Scarf. 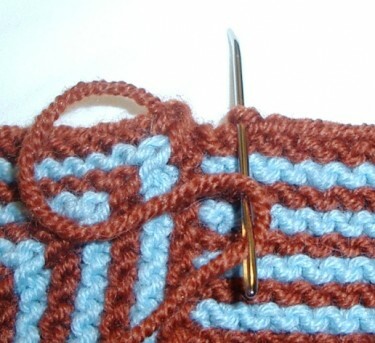 I like how the edge stitches are all the same color on one edge; they are all one color on the other edge, but it is the opposite color! Fun arithmetic at work there. I also liked how the bottom edge lent itself to asymmetrical, bi-color fringe. But naturally, I like the design. What do others like about it? 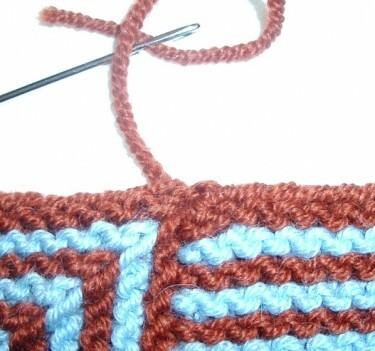 Sometimes modular knitting creates irregular edges where one module or unit meets another. There can be little notches rather than a smooth edge. 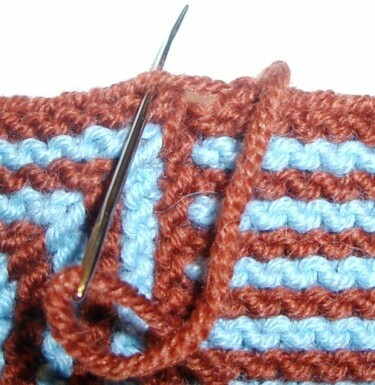 In the Zed Scarf, I used two different methods to make neat edges. 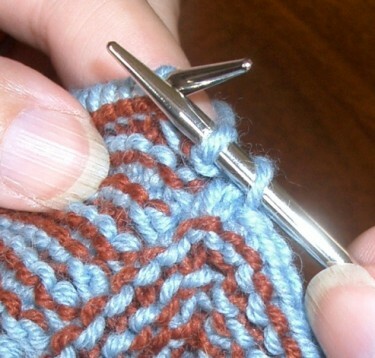 First the Left Edge, because you deal with that during the knitting. 1. On left edge, pick up last st bound off in previous module. 2. 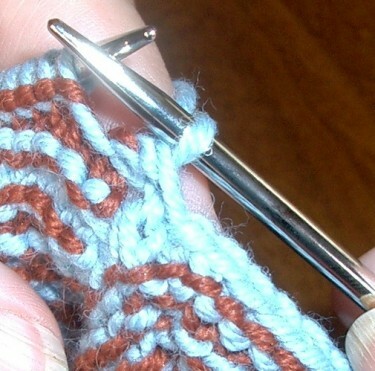 Knit 1 st. Now there are 2 sts on right needle. 4. Continue binding off. Nice, unnotched edge! 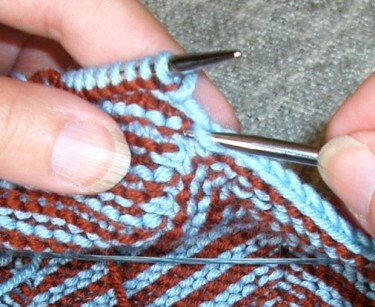 The Right Edge is de-notched as part of finishing. 1. Right edge before magical smoothing with yarn tail. 2. 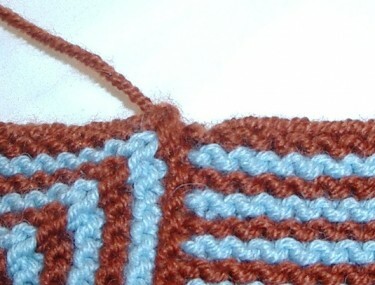 Begin weaving in yarn tail. Go back farther than you might expect. 3. Bring needle back to module it started in. 4. 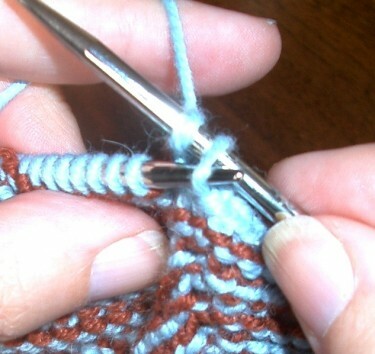 Pull yarn to adjust tension and make it look the same size as other edge sts. 5. Yarn tail woven in, and the two modules are smoothly joined. No notch! All you have to do now is choose two colors that look good to your eye. What will they be? 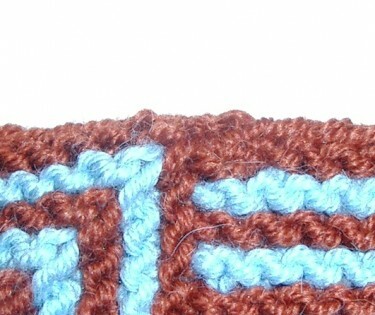 This entry was posted in knitting, pattern, technique and tagged colorwork, edge treatment, Knitscene, modular, Zed Scarf. Bookmark the permalink.